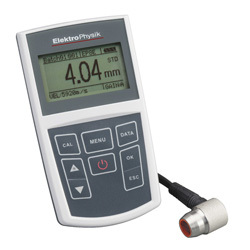 Sturdy and accurate ultrasonic thickness gauge based on the ultrasonic pulse run-time method. 6 ultrasonic probes with frequencies ranging between 2 and 10 MHz in different designs offer a broad spectrum of applications and thickness measurements ranging from 0.65 mm to 500 mm. A high temperature ultrasonic probe is also available, designed for measurement of hot materials with temperatures of up to 350 °C. The device is equipped for automatic detection of the intelligent ultrasonic probes and re-calibration is not required upon switching probes. The calibration data of the sensor is saved in the probe. Uninterrupted scanning of a part for thinning is possible at the minimum mode. Sensitivity can be set to "Auto" or "Manual"
Size 5.1 x 2.9 x 0.94"